Take Driving Lessons in Romford with A Class Learners The Romford Driving School - We have Fully Qualified and Experienced Driving Instructors available in Romford at much better prices than the rest. Find professional driving lessons in Romford, Hornchurch, Collier Row and all surrounding areas. A Class Learners driving instructors are fully qualified and have a good success rate of getting you through your driving test compared to most driving schools in Romford. A Class Learners driving instructors are all fully qualified and tested by the DVSA to make sure you recieve the best driving tuition in Romford using a learner centred method. You can now book online without paying. You pay our driving instructors in cash on the day of your first driving lesson in Romford. Find out more on our prices and decide which driving lesson block booking is best for you. Driving School Romford, Driving Lessons Romford, AClassLearners, The Driving School covers: RM1, RM2. RM3, RM4, RM5, RM6, RM7, RM8, RM9, RM10, RM11, RM12 and RM13. We also offer driving lessons in surrounding Romford areas please call to check if we cover your postcode. Contact us 0208 220 7402 or Text 'Driving Lessons Romford' to 07943003001. To book your driving lessons in Romford or Hornchurch and surrounding areas call our Driving School in Romford on 0208 220 7402 or Call or Text Driving Lessons Ilford to 07943003001. A Class Learners, The Driving School in Romford offers cheap driving lessons in Romford from as little as £16 per hour. Please see our prices page for more information. 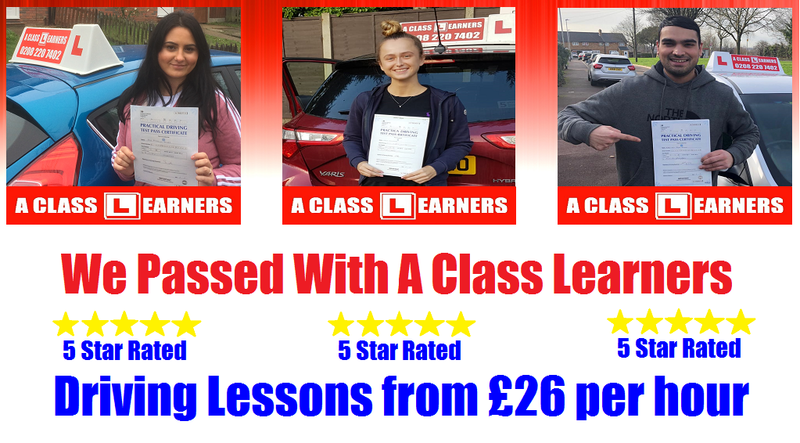 Here at A Class Learners the driving school in Romford we have been established for over 25 years now and have been around much longer than any other driving school in Romford and have built up a good reputation with learners in Romford. Driving instructors in Romford that are with A Class Learners are fully qualified DVSA approved driving instructors and are highly motivated experts to teach you how to drive in Romford. We have both male and female driving instructors that are patient, reliable and friendly. Our driving instructors in Romford use track records so that you know exactly at which stage of learning you are at every step of the way. We offer Automatic Driving Lessons in Romford, and surrounding Romford areas. It's much faster to learn how to drive in Romford if you learn in a automatic car. There's no gears to change and you will find it easier to coordinate the controls. Our Automatic driving lessons in Romford are available from 9am till 6pm. Please contact us for more information. Our Driving Lessons are a minimum of 1 hour. You can take as many hours per week depending upon your requirements. We only offer one to one driving lessons that are tailored to meet your learning needs. You will not be dissappointed. Unlike other driving schools in Romford our prices are very competitive and you will get a fully qualified driving instructor for the price you pay. Here at A Class Learners we also offer intensive driving lessons in Romford sometimes called intensive driving courses in Romford. Intensive driving lessons in Romford are great for those who want or need to pass there driving test quickly and get their driving licence. We can also arrange driving test cancellations at your local driving test centre. If you have driving experience our Driving Instructors will assess you first and let you know how many lessons you will need to be fully ready for your driving test before taking your driving test. Call 0208 220 7402 or Call or Text Driving Lessons to 0794 300 3001 To Book Your Driving Lessons Change your life, Learn to Drive in Romford. Change your Life ... Learn to Drive in Romford. To book your driving lessons in Romford contact us on : 0208 220 7402. Please check out our driving lessons special offers on our prices page for more information.